3BR\2BA-HEATED POOL, Wifi. One block to beach and boardwalk. 1st Floor SLEEPS 8.. 3 bedrooms, 2 full bathrooms, ..Heated Pool & Grills .. Very Clean & Spacious Condo. Unit has 3 bedrooms, 2 full baths, living room, dining room and Kitchen. Entire unit is newly painted and Carpeted throughout. Living room has 50”plasma TV, full sofa and sofa bed. Master Bedroom has King size bed and full bath. Middle Bedroom has Queen size bed. Back Bedroom has 2 twin beds. Unit has Central Air, ceiling fans in all rooms. There are TV’s located in each bedroom. Kitchen is fully stocked with cookware, glassware, coffee maker, etc. All linens, beach & bath towels are supplied for your stay. The unit has a full size washer and dryer. There is a balcony with table and chairs and view of the pool from two bedrooms. Comfortable patio area by pool with lounge chairs, 2 gas barbecue grills and outdoor shower. Shared 2 car garage & plenty of free parking. Oversized vehicles have to park on the street. BEACH IS FREE. All you'll need is your bathing suit & toothbrush. Don`t now & enjoy your stay! NO SMOKING OR PETS PERMITTED. WE DO NOT RENT TO GROUPS UNDER 25YRS. Property is located 1 block from the Crest in a quieter section of Wildwood. Property Address is 235 East Hildreth Ave Unit #100 (corner of Hildreth and Atlantic). No need to drive anywhere. Just park your car in the 2 car garage and relax. Location is within walking distance to beach, boardwalk, mini-golf, arcade, restaurants, parks, bike rental and ice cream parlor. Tram car can be picked up 1 block away to take you to all the amusement piers. There are several surrounding restaurants within walking distance including Adventurer, Dominic's, Duffy's, Ravioli House, Little Italy, Bandanas and Dairy Queen. There are several parks nearby which also include playgrounds, basketball, tennis and baseball. Contact me to book the property. You can view my contact info in the pictures on the site. Once I receive your inquiry, I will send you the rental application. When you receive the application, fill it out in it's entirety, sign and mail it with 50% deposit of rental. Balance is due 30 days prior to arrival date, along with the $140 cleaning fee and $500 refundable security deposit. Please include a separate check for $500. This is your security deposit check, which will be refunded to you within 30 days once the unit is inspected. This unit is NOT available for nightly or partial week rentals. Swimming & relaxation by private in-ground heated pool. Pool is open from Memorial day weekend until end of September. Enjoy views of the fireworks display on every Friday night after July 4th and free concerts at Fox Park! 2 car garage, 2 gas grills available, outside shower, private patio, heated pool, TVs in each bedroom and living room with cable and DVD player. Playstation3 with wireless internet are also included. AC/Heat/Ceiling Fans (this unit can be used in the off season), full size washer, dryer, ironing board, iron, linens, towels, cooking utensils, appliances, beach cart and umbrella are available for your use. Pool is open 9am-8pm 7 days a week from Memorial day until Labor day. The pool is open Fri-Sun from Labor day until 9/20. YOU WILL FIND THIS UNIT EXCEPTIONALLY CLEAN AND WELL MAINTAINED. Comfortable patio area with plenty of lounge chairs and 2 barbecue grills. BEACH IS FREE. VERY CLEAN NEWLY PAINTED! Don`t wait, book now & enjoy your stay! **NO PETS**NO SMOKING**NO SENIOR WEEK OR PROM RENTALS** WE DO NOT ALLOW SMOKING IN THE CONDO AND CANNOT ALLOW ANY PETS. We only rent to families and mature adults, No Senior Week or Prom rentals. Unit has shared garage. Oversized vehices will need to park on street. See pictures of garage. We loved our stay and the condo has so many amenities, plenty of room and very clean! Perfect location and the decor was nicer than the unit we stayed in last year in the came building.Definitely will re-book for next year if available!! Place was great. Big enough for my family of 6 and plenty to do. The board games and PlayStation kept my kids entertained on a rainy day. Having all the beach stuff and towels supplied for you was a big help. 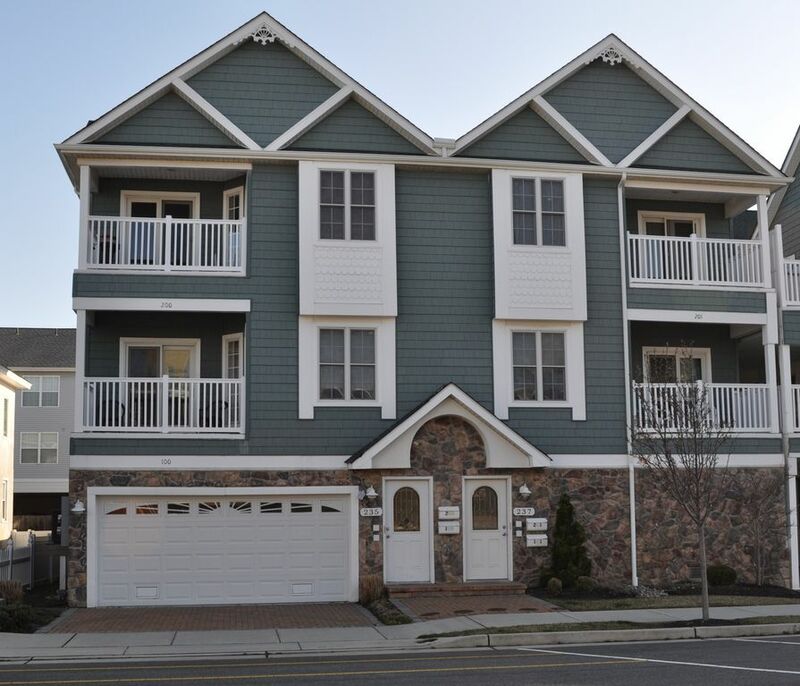 It's walking distance to the beach and boardwalk. Thanks again! We had a great week in Wildwood! The condo is in a perfect location - close to the beach, boards and a variety of restaurants. Its beautifully decorated and the most equipped condo we have ever stayed in with lots of dishes, pots and pans and tons of beach supplies. The pool is a perfect size with a lot of lounge chairs around it so we were always able to find a chair! Kevin was responsive and great to work with! Thank you for sharing your beach home with us! This is an excellent place to stay. This is our 6th year staying here and we wouldn't look for another place! Vacation is stress-free knowing we are staying in a place that is well kept and comfortable for me and my family. We enjoy our visit every year. Communicating with Keith was a breeze. The property is even better than the pictures. We were 5 adults and 1 baby in a pack n play, and we all fit comfortably. Beds were comfy. The pull out bed in the sofa looked to be unused but we tried it out and could feel the springs so I wouldn't plan on sleeping on it :-( Keith is stocked on all of your beach equipment, towels, sheets, pretty much everything. We found an air mattress in there, too! The parking pass was a huge bonus as we could not get our two cars to fit in the garage and were relieved to know we could park on the street at meter spots. Can't wait to stay here again! Restaurants within 1 block away- Little Italy, Duffers Restaurant and Ice cream parlor with arcade and mini-golf, Dominics Place, Bandanas Mexican Grille, Dairy Queen. UNIT IS ONLY AVAILABLE FOR WEEKLY RENTALS. NO NIGHTLY OR WEEKEND RENTALS AVAILABLE FROM JUNE TO SEPT.